a.) Look at the cut-quality of the diamond. If a diamond is well-cut, it'll increase in brilliance and sparkle. You can judge a diamond's brilliance and sparkle by way it is cut in shape(e.g., oval, heart, pear), style(e.g., step cut, brilliant, single or full cut), in proportions (e.g., big or small table facet, deep or shallow pavilion) in the finish of the gem, which is separated into polish(e.g., smooth flawless surface, polishing marks, rough girdle, scratches, pits, abrasions) and in symmetry (e.g., misaligned facets, off-center cutlet or table, symmetrical facets, etc.). b.) As far as choosing color of the diamond, it is really based on a persons taste. If you like expensive diamonds, then a colorless diamond ranging higher than the L color. 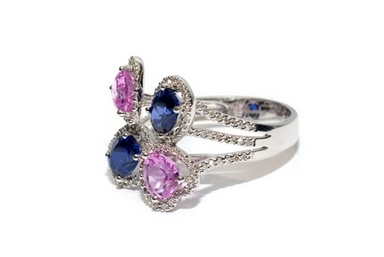 Or if you have distinctive taste, you may want to consider buying a fancy color diamond. The colors and their ranges are from: colorless, white, light yellow, yellow to fancy colors (e.g. red, black, orange, purple, green, pink, etc.) and ranges from D to Z for the colorless to yellow diamonds. FI: Flawless - no inclusions inside the diamond and no blemishes on the surface. IF: Internally Flawless - no inclusions and the blemishes are too small to notice. VVS1 & VVS2: Very, very slightly included - extremely small flaws and difficult to see with a 10x magnifier. VS1 & VS2: Very slightly included - minor inclusions from difficulty to see to easy to see under 10-power magnification. SI1 & SI2: Slightly included, noticeable inclusions easy (SI1) or very easy (SI2) to see under 10-power magnificaton, but not visible normally to the eye. I1. I2, & I3: imperfect - flaws are visible to the eye, that ranges from just visible (I1) to extremely visible to the naked eye (I3). Some I1 and I2 diamonds might be damaged from ultrasonic cleaning. Also, they may be less resistant to strikes. d.) A diamond's carat weight is a unit which equals to 1/5 of a gram. A small diamond's weight is usually expressed in points. One point equals 0.01 carats. These points are labeled as 1 ct TW (one carat total weight), which are different from 1 ct (the weight of one stone). 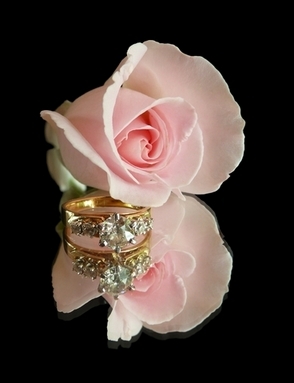 A 1 ct top quality diamond ring could be worth 10 times more than or as much as a 1 ct TW diamond ring of the same quality. You want to buy a transparent diamond ring with treatment status. 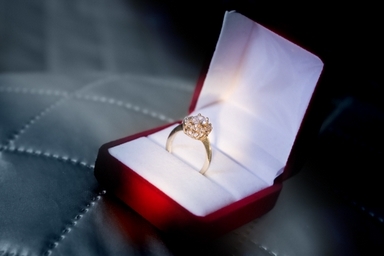 An untreated engagement ring has durability and desirability. A natural diamond has withstood the test of time and is more resistant to damage and abrasions. Most people know what kind of engagement ring they want to buy for that special someone in their lives, but, just in case, you want to buy an engagement ring according to your loved one and your taste, style and budget.